Jamie is a 36-year-old family man from New Zealand. He contacted us in September 2015, after 10+ years of pain caused by a Skiing accident when he was younger. Jamie’s back continued to deteriorate, to the point where he had to consider surgery. 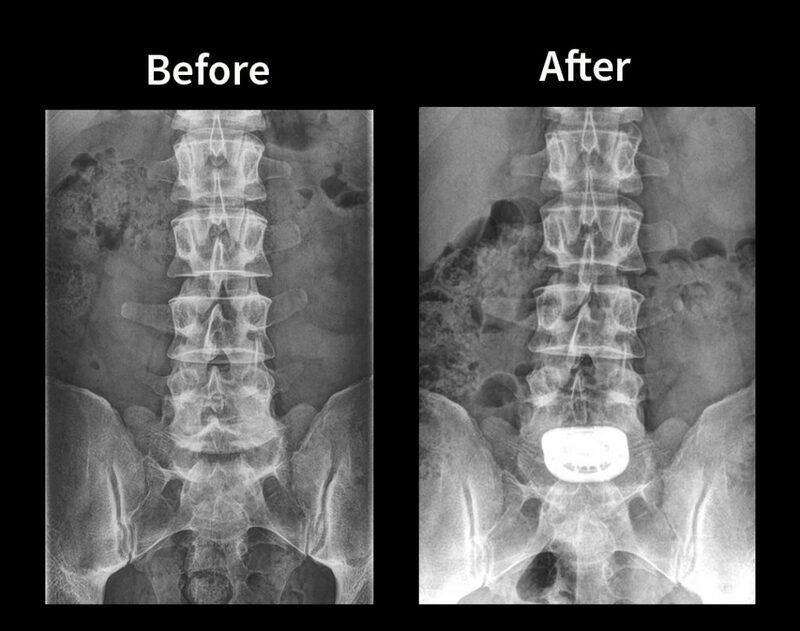 He saw three spine surgeons in New Zealand, Two of whom recommended him for spinal fusion at the L5/S1 level, and one who would not offer him any surgical intervention due to his young age. We coordinated an assessment of Jamie’s case by our German Spine Specialists. Total Discectomy by anterior approach and Artificial Disc Replacement (ADR) at L5/S1 using the M6-L implant. Important: Given the shown mild disc dehydration at the L4/5 level above, the surgeons expected a progressive degeneration of this level if Jamie were to have a normal spine fusion. The natural and healthy movement of the M6 Disc would best mitigate any chance for future spine surgery. After three months of extensive research, discussions with our past patients, and also with his trusted GP at home, Jamie flew to Germany for his spine surgery with Dr. Thomas Bierstedt. Just before he departed New Zealand for his Artificial Disc Replacement in Germany, Jamie sent us a copy of the detailed letter he wrote to his parents, informing them of why he wanted to travel to another country for spine surgery, and asking for their blessings. I have been thinking about the best way to present my thoughts to you both regarding my proposed back surgery and I feel that putting these thoughts and the relevant information down in writing (as per Dads idea) is probably the best way to clearly articulate my thoughts without becoming emotional about it. As you may or may not be aware my back has been presenting me with worsening symptoms over the past 5 years and I have been trying to work through these issues with core strengthening, massage and acupuncture along with behaviour modification to remove the more impacting activities from my life. Unknown to me the issues I have been having with my feet are related to the nerves in my back. These issues have become significantly worse over the last 1-2 year and in the last 2-3 months to the point that I have limited periods of time where I am not in pain, discomfort or experiencing moderate to severe numbness and pins and needles in my feet and legs. If I sneeze I often end up on my knees. While this is still at manageable levels, it is very draining and I have a genuine concern which is reinforced by Sheldon, that I may end up in a state similar to a large number of patients on line who have lost the ability to walk unaided or with permanent drop foot due to damage to the nerves through prolonged pressure. There is currently no repair for this once it occurs. I am currently unable to participate fully in my life and while I am still able to undertake some activity it is difficult and painful. Being an active person who wants to participate fully in his life and the life of his family and being told sorry that’s not an option anymore is very hard to deal with. Sport and activity is how I deal with stress in my life, it is a large part of who I am and it makes me happy. I have recently made the decision to start using pain killers again to try and ease the pain symptoms and this has certainly helped however it does not relieve the other symptoms and I do not want to get into a situation where I permanently rely on these to operate in my daily function. I am also seeing a counsellor to help me learn mind strengthening exercises to help me deal with the chronic pain and stress that this is causing in my life. Since we discussed the concerns that you both have with me undergoing surgery I have spent a huge amount of time considering the matter, carrying out additional research, talking with Bex, trusted friends, work colleagues and Sheldon about the facts as well as actively seeking out more information from online forums and the ONZ clinic in Germany. I have also been trying to collate these thoughts into a sensible format. I will tell you now that I have made the decision that I am going to have the Artificial Disc Replacement (ADR) surgery but I also want to tell you that while I have made the decision, I have agonized over it…not for any reason to do with the surgery but for not wanting to go against my paren’ts wishes. While I am an adult, a father and a husband, I am also your son and going against the wishes of my parents is very difficult for me. I therefore want to try to provide you with sufficient information to help you understand why I have made this decision and also to alleviate any concerns you may have about the procedure and its risks. Hopefully you will support my decision. These issues have affected me for 16 years since my original back injury. Over this time I have come to terms with the issues, the pain, discomfort and the fact that I took too many liberties with my body. Would I do it all again? Probably Yes. My life would not have led me to where I am today without these things happening and I would not give up Bex and Flynn for anything even if it meant staying in pain for the rest of my life. However I have in the past 10 years given up Skating, Skiing (hoping to start again), squash, free ride mountain biking and surfing to reduce the risk of causing more serious damage to my body and to ensure I am around for Bex and Flynn for as long as possible. I loved all of these activities but I knew they were causing me damage and presented a higher risk. The sport activities I undertake now while they may seem extreme to some people from an endurance perspective they actually present very low risk of further back injury. To give up such a large part of my life is not an option to me but I am certainly conscious that a big part of the next phase in my life is going to be continuous rehabilitation and recovery. This doesn’t mean stopping my active life but mixing it with core strengthening activity and tempering my enthusiasm when I take part in more dangerous activities. In saying that, the surgeons who do this surgery are confident that people can get back to pretty much all the same activities, as they previously would have participated in if they don’t have genetic type degeneration issues. I understand the mechanics and science behind the issues and solutions to a level that makes me comfortable in the action that I intend to take. My injury was not caused by long-term wear and tear or genetic issues but by one of significant trauma. The damage is located in an area that is low risk when it comes to ADR but also presents a high risk of Adjacent Segment Disease (explained later) due to the high loading on the area under fusion surgery. With an M6 Lumbar implant the area retains full natural range of motion, retains cushioning equivalent to a healthy natural disc and this lowers the risks of having to undergo further surgeries in the future. 2. Why is the procedure not approved yet in the USA and why is it not widespread in other countries? While the perception is that this surgery is new and untested, the first implants were actually carried out around 33 years ago in Germany, with some reports saying that experimental work was done as far back as the 1950’s. The procedure is now relatively widespread and is growing every year and the spinal kinetics M6 implant is used in many first world countries including Germany, Argentina, Austria, Denmark, Italy, Netherlands, Switzerland,the United Kingdom and others are picking it up all the time. It is available in 27 countries including Australia and in theory the implant is available in NZ but I don’t know of any Surgeons offering the surgery here (based on the distributers website). However having the implant available in a certain country is only part of the equation. The other part is the skills and experience of the surgical team which is key to the success of either fusion or ADR .The implant proposed for my case has been implanted into over 30,000 patients in the last 8 years and the German Neurosurgeons have led the world in this area having developed the techniques and carrying out the first surgeries. They continue to lead the world in this area of spinal surgery. Therefore even if a local surgeon could do it I would still intend to go to Germany to get the most experienced surgeon and the most likely and high probability of getting a great long lasting result. The United States started clinical work and trials in 2000 and the FDA has started their own clinical trialling and studies of the M6 implant in the last couple of years, albeit quite a few years behind the aforementioned countries however the USA presents many complications to new medical treatments, medications and surgeries. There are world leading scientists, surgeons and companies in the USA but their political and lobbying systems essentially flaw the ability to easily role out new products. Some people might say this is safer as it provides a more robust testing regime but often the delays in approving new technology relate to issues around personal liability, lobbying by other interested or affected parties and insurances etc. rather than whether the product is good so looking at the USA is not really effective measure in my view. – Basic rudimentary design of the early implants. While there are cases of failed surgeries I have been unable to find any cases on line of M6 Implant failures or of negative feedback and I have been actively searching. I assume that there must be some failed cases out there but if they are they must be minimal. In fact I have one report that states that there has been no cases of M6 implant failures anywhere in the world (not including surgical issues or postoperative slippage due to issues prior to the bone healing which are very low). In general, I agree with you on this. However, we are not talking about an Asian website that just got set up last week offering genuine Rolex watches. I have no doubt that Dr X is clearly a very well respected and talented Orthopedic surgeon and he may very well have carried out some ADR surgeries however this would have been with the older prosthesis and at a time when the techniques being used were not as well refined or honed. I also wonder what experience he had, who trained him to do the surgery and how many did he actually do? Did he have all of his ADR surgeries fail? If so this would be unusual as the success rates in studies on line are very high and much better than fusions based on the studies I have seen to date. 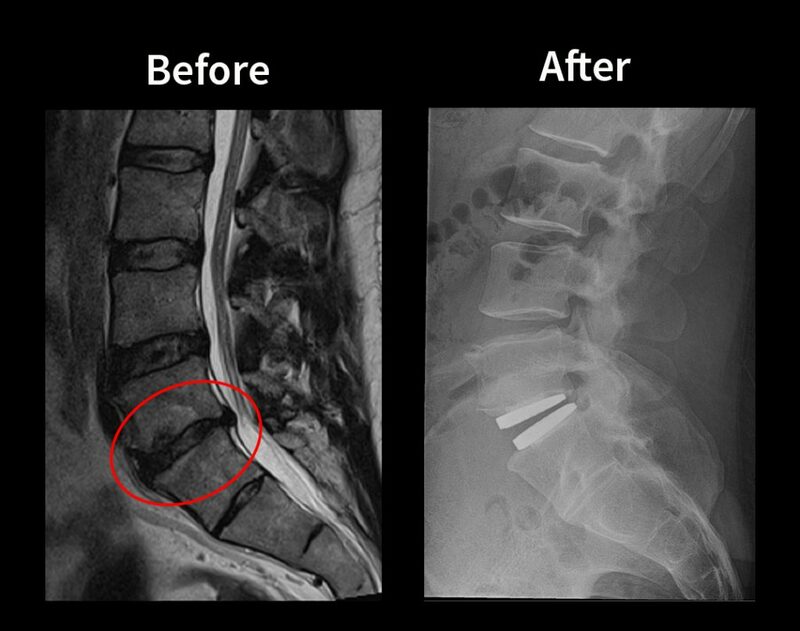 The team at ONZ are neurosurgeons who average 400 spinal surgeries a year each with over 200 of these being ADR’s including exceptionally complex multilevel disc replacements from Lumbar to Cervical, facet joint replacements etc. They also carry our fusions and other spinal surgeries where appropriate. They are the go to people for the complicated surgeries that no one else will take on and they have an excellent record of success in alleviating serious pain issues much worse than mine. They do not offer ADR to everyone who submits their records; in fact they only take on about 6% of the cases that are submitted for review. Their focus is on allowing people to retain range of motion and to help ease patient’s pain. My research has also told me that should there be an issue with the implant further down the road that this can either be replaced or the joint can be fused in the future if it ever presented further issues down the track. As my issue is simple and below where the Vena cava and Arterial blood vessels bifurcate, the risks around blood vessel damage are not an issue in my case. So going in for follow up surgery is not an issue although it is very rare. In regards to waiting to see Dr X before making a decision, I do not see this as adding substantial value. Within NZ the only surgical option is Fusion. He will not be able to provide any other permanent solutions and no matter how experienced he is with back surgeries he does not have the experience that the ONZ clinic has to do the M6 implant and so even if he offered to do this I would not accept it. If he had been able to see me in a reasonable timeframe, as the other surgeons have, I would have gone to see him, if only to allow you further comfort however as he is unable to see me until the end of February 2016 at the earliest and this will mean that I will have to leave my life on hold for at least another 6 months before I can get on with the surgery and subsequent long recovery. I do not want to delay that long when there will be no discernible advantage to waiting. “Bone spurs or osteophytes often occur as a consequence of degenerative disc disease, loss of disc height and reduced motion. A significant part of disc replacement is the meticulous removal of existing bone spurs, the re-elevation to the original intervertebral height and restoring the natural motion by the implantation of the M6. These come in different sizes and heights. The appropriate implant size will be determined during surgery. Re-occurring bone spurs post disc replacement with the M6 implant is unlikely (< 2%) Facet arthritis post disc replacement had been more an issue with previous implant types, e.g. ProDisc, Charite or Maverick. These implant types preserve uncontrolled motion and thus create a hypermobility issue, causing stress on the facet joints. As opposed to these implant types the M6 restores only the natural biostatical motion, i.e. flexion, extension, rotation, shearing and torsion – each to 6 degrees. Due to its sophisticated design, the M6 restricts extension and provides additional shock absorption.” While I have some signs of bone spurs etc. they are very minor and not within the facet joints and so there would be no issues with this. Adjacent Segment degeneration with fusion surgery in younger patients (transferring the stresses onto adjacent discs and causing damage). There are significant numbers of cases to be found on the Internet where people, especially younger patients, have had one surgery after another as the problem migrates up the spine. This leads to almost continuous pain, partial or full paralysis and are especially prevalent in people who lead any form of active lifestyle as the fused joint no longer absorbs any impact and so the other discs have to pick up the slack. – If you get a nail in one tyre and it bursts. You take it to the tyre store and replace the damaged tyre. Away you go. I already drive slowly so my preference is to not have to slow down any further if I don’t have to…. I was frustrated when the surgeon told me he would not do the surgery and I think that if you talk about quick decisions or impetuous behavior… that was it. So I went and saw another surgeon who told me that there are no non-operative treatments that will help my case and that he felt fusion was the only option in NZ, he then referred me to another spinal surgeon who he felt would be more suited, who also told me that Fusion was the only option, was straight forward and stated I could get back into sport etc. During my conversations with you both you raised serious and valid concerns and I have taken them very seriously, actively searching out answers to questions where I did not already have answers. These queries have all reinforced my decision to have the surgery as it has led me to seek out information, talk to additional people and to really think about my life. 1. DO NOTHING – Learn to live with constant pain, risk partial or full paralysis and drastically modify my life. 2. FUSION – Stay in NZ, get fusion surgery, risk of adjacent segment issues, high failure rates in younger patients, reduced range of motion and still have to significantly modify my life, long rehab and recovery timeframes, long wait times before surgery could be carried out, maybe the surgery is free or cheaper. 3. ADR SURGERY IN GERMANY – Travel to Germany, ADR surgery, short recovery, back to leading 99% normal life, very low failure rates, quick turn-around means getting back to life sooner. Pay $60K but get a better long term result I do worry about putting us $60,000 in debt to pay for the surgery. In fact I have ached over the balance of my pain and discomfort versus the cost and affect it will have on our future. While Rebecca is very supportive it is still major factor that we have been working through, as it will essentially add years to our mortgage. However if the tables were turned I would do everything and anything in my power to ensure that Bex (my wife) got back to being happy and healthy even if that means taking on debt to do it. We have however made the decision to try to sell our rental property to take the pressure off financially by removing that additional mortgage debt and to release some capital to help fund the surgery. It was a big decision as we both feel that this investment was a 5-10 year hold and that was always our plan however this is the level of commitment that we are putting into this and so I want you both to understand that while this seems to you both that I have made a quick decision that it was in fact very carefully considered, discussed with many people and was not taken in any way lightly. Mum… how long would you be willing to give up all of your artistic endeavours if you knew there was a solution available immediately? Would you wait 6-12 months to be told that the only option in NZ is to have surgery that meant that you could only go back to 50% of your activities and that it would take another 6-12 months to be able to even get to that point? What would the waiting accomplish? Or would you take the “risk” of having well tested surgery that has a really high outlook of getting you back to full operation within 3 months and oh, by the way, you can have it… next month …no long wait times. Add to that a son who wants to play with his dad, a wife who wants her husband to be happy, healthy and comfortable and a dog who looks at me and can’t understand why I won’t take him running anymore… it becomes a very easy decision for me to make. I am currently planning on travelling to Germany in mid to late November 2015. This allows me time to get prepared before I go and to undertake the EKG and Blood tests required. I will then be away for around 3-4 weeks subject to recovery. This means I am back in mid December. My work looks like it will be quiet during this period and then I will have time over Christmas to recuperate before several of my projects kick off in January/February 2016. I have not worked out a scenario that works for a suitable support person to accompany me as of yet but am currently working out how we can manage that side of it but if it comes down to it I will travel by myself. I am open to suggestions and discussions around this side of things. I love you guys and really want you to understand why I have made this decision and hope that you will support me through it.